The GolfWorks proudly presents our 2019 state-of-the-art clubmaking program. Golf enthusiasts and clubmakers alike have traveled from all over the world to take one of our exclusive PGA accredited classes! Ralph Maltby wrote the book on golf club fitting, assembly, repair and dynamic playability — literally. 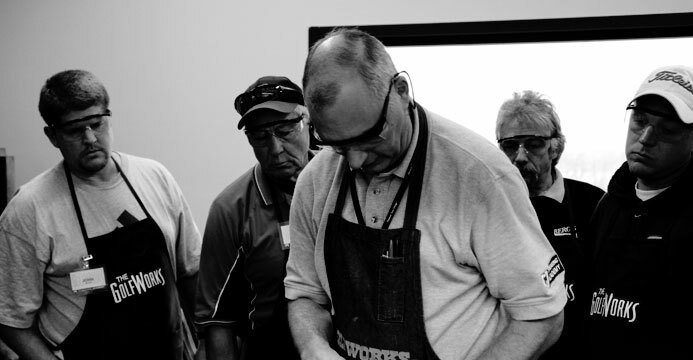 Attend a GolfWorks Clubmaking Academy program and you will gain a complete understanding of today’s vital clubmaking, club repair and club fitting skills. 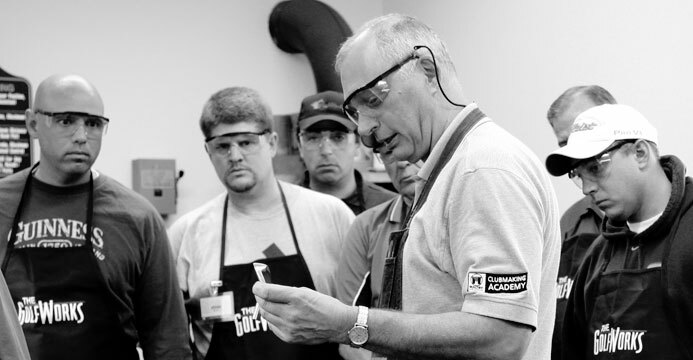 Maltby Clubmaking Academy workshop﻿Our premier technical experts provide you with the most comprehensive clubmaking instruction offered in the industry today. Our classes qualify for the PGA and LPGA Continuing Education Programs. 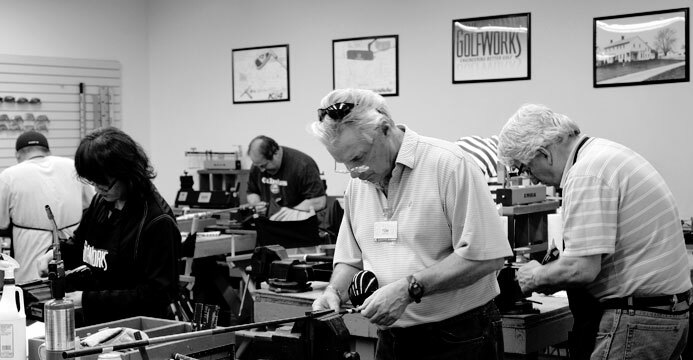 The academys instruction manuals are written by Ralph Maltby, who is the leading authority on club design, fitting, and repair. Hundreds of golf professionals from the PGA of America have also attended our schools. Why? Because the teaching manuals used in our schools are also used by the PGA of America in their seminars and workshops. In fact, many golf professionals choose to supplement their PGA-based education by visiting the source of golf club repair, fitting and assembly. Due to the high demand for The Golfworks Schools, and because there are many people that lack the time to commit to a full week school, we have designed a rewarding two-day course on Golf Club Fitting and Assembly. The Fitting section covers golf club design and the affect on golf club performance, along with all the basics of fitting loft, lie, club length, swingweight and total weight. Golf shaft basics are also covered along with procedures on how to choose the right shaft. Golf grip sizing and selection are covered, along with selecting the right set make-up for better scoring. You will learn to conduct a "mini-fitting", which is a shorter, dynamic fitting session that is preferred by many tour professionals. During the assembly portion of the school, you will learn professional assembly techniques that apply to the hobbyist or volume golf club builder. Included is proper clubhead preparation, steel and graphite golf shaft installation procedures, swingweighting, golf grip installation and much, much more. During the working periods after each skill-based presentation you will assemble a hybrid, wedge, and putter. You will also learn special "Tricks of the Trade" that come from the most experienced training staff in the golf industry. This school package includes 2 days of the best instruction available and lunches for both days. In addition, each student will keep the hybrid, wedge, and putter he or she assembles (a $150 value). You will also take home instructional books and videos and a GolfWorks shop apron (over $125 value). All this included in the $99 price of the school. The GolfWorks Professional Clubfitting School takes basic clubfitting to the next level. In this course we cover topics such as: the basics of golf club fitting, modern golf equipment/effect on performance, and golf swing's relationship to ball flight and performance. Students will also learn how to match each critical equipment parameter to the swing requirements of the golfer, how to customize specifications and set make-up, and how to dynamically fit a complete golf club set - woods, irons, wedges and putters. 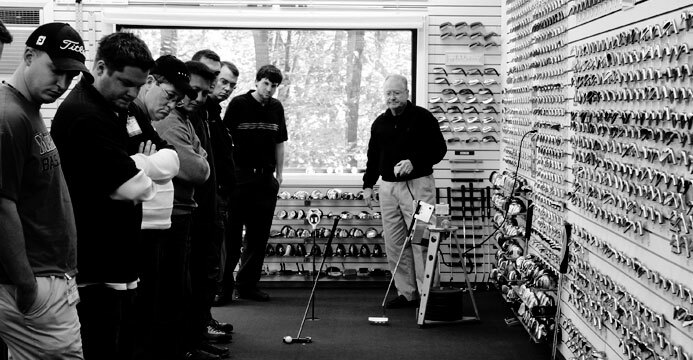 Important topics such as proper techniques for measuring golf club specifications and proper putter fitting using the Maltby Putter Fitting System will be discussed as well. The most comprehensive training program available in clubmaking today. This course has set the standard for complete clubmaking and repair instruction for two decades! Your tuition includes two instructional books, five videos to keep, and a computerized golf club fitting evaluation. You will also receive a $100 merchandise credit allowing you to purchase the necessary components of your choice to assemble your own club(s). The Maltby Advanced Shaft Technology Academy will teach students a golf shaft's role in performance, shaft terminology and the manufacturing process for both steel and graphite. Previous club assembly experience is required. It is recommend that each student has attended the Fitting, Assembly & Repair school or another qualified club assembly or repair course. All students will assemble a frequency matched set of irons. The set of irons is theirs to keep. 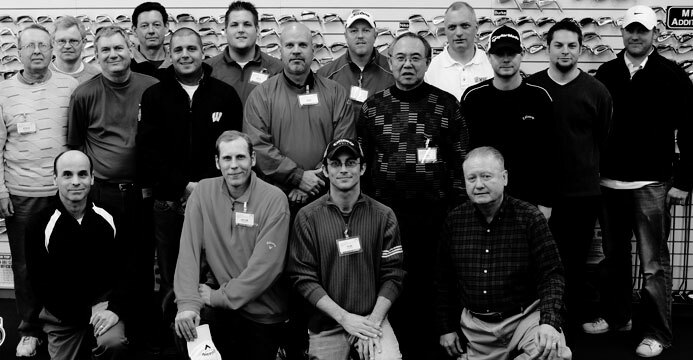 The Maltby Golf Club Repair Academy will teach all the necessary skills to handle virtually any golf club repair. Topics covered in this class include: shafting, gripping, adjustments and finishing. Registering for a GolfWorks Clubmaking Academy program is as simple as making an online deposit (sign-up below). Or call our toll-free number 1-800-848-8358 and request a school packet. We will send a complete brochure on all five programs, as well as an application for attendance and hotel accommodation information. Fill out the application and return it to The GolfWorks. Our staff will contact you with the date of your class and any other necessary details. Or if you are making a deposit via the online sign-up then you will receive an email confirmation.